Add water, sugar and lemon zest to small sauce pan; heat over medium-high until boiling. Pour through fine, metal sieve; discard solids. Stir in lemon juice and allow to cool until needed. Add granola and paprika to bowl of food processor; pulse until finely ground. Wet rim of 6 oz glass with water; dip into granola Rim Garnish until coated. Place 5 raspberries and 1 mint leaf into glass. Combine orange juice, non-alcoholic ginger beer, Citrus Simple Syrup and ice cubes in pitcher; stir until well combined. Strain out ice and pour 4 oz into glass; add 1 tsp grenadine and serve immediately. 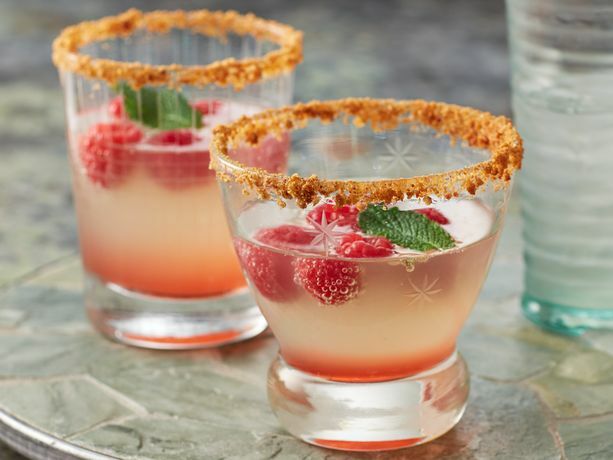 Tip: Use lemon or lime wedge to wet rim of glass for additional flavor if desired. For an adult only beverage, add 1.5 oz gin or tequila when combining liquids.